In order to apply for this scholarship, you must not have a course application in the ECU system. Questions about this scholarship can be directed to studyecu@ecu.edu.au. not be an Australian Citizen, Australian Permanent Resident, or New Zealand Citizen. The following terms and conditions apply to the scholarship. The scholarship recipient may be ineligible for the scholarship if they are in receipt of a government scholarship or industry sponsorship during the term of the scholarship. This is at the discretion of ECU. The scholarship cannot be combined with any other scholarship or offering from ECU. The scholarship recipient must comply with any applicable student visa requirements. The scholarship recipient must attend a minimum of 80% of all on-campus components. The scholarship recipient must apply and accept their course offer within the time periods specified by ECU (if the course offer is not accepted within the stipulated deadline the scholarship offer will lapse). The scholarship recipient shall not defer their studies during the term of the scholarship. The scholarship recipient must be reasonably available to support ECU’s marketing and communications endeavours through attendance at key marketing events nominated by ECU. The scholarship recipient must pay their tuition fees within the stipulated payment deadlines, failure to do so will negate the scholarship and the tuition fee structure will revert to full-fee international tuition. If a student changes their course and does not seek a new scholarship before applying for the new course, the scholarship may not apply to the new course. The education agent or student must use the link provided to access the discount; it cannot be applied after an application has been completed. All scholarships are awarded at the discretion of ECU based on the information submitted by the student in the Scholarship Pre-Approval form and in their course application. ECU reserves the right to revoke the scholarship at any stage if a student is found to have provided information that is misleading, does not meet the scholarship eligibility criteria (including ECU’s standard and specific admission requirements), or does not comply with the ongoing conditions of the scholarship. ECU reserves the right to decline to award scholarships if, in its opinion, there are no suitable applicants. The number of scholarships awarded shall be at the sole discretion of ECU. If you believe you are eligible, click the 'Pre-Apply Now' button below to demonstrate you meet the scholarship eligibility criteria. IMPORTANT: This scholarship requires pre-approval BEFORE you apply for a course. Please wait until you hear from us before applying for a course. If you apply for a course before this step, you’ll be automatically declined for the scholarship. 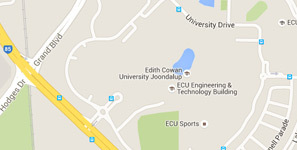 Please visit the ECU Melbourne and ECU Sydney page.